The Final Grand Slam is here. Kick off today. The final will be on September 9th. Can Roger Federer defend his title for the 4th time? Who will stop him this time? Nadal? 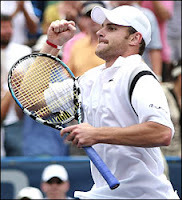 Roddick? or new entry like Isner? 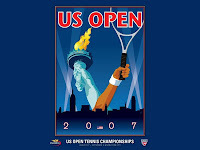 In Women's Singles, I would love to see the either the Williams sisters or Ana Ivanovic in the finals. DENVER -- The Earth's shadow will creep across the moon's surface early Tuesday, slowly eclipsing it and turning it to shades of orange and red. The total lunar eclipse, the second this year, will be visible in North and South America, especially in the West. People in the Pacific islands, eastern Asia, Australia and New Zealand also will be able to view it if skies are clear. Peminat siri Lost, jangan lupa menyaksikan episod terakhir malam ini. Only on AXN! 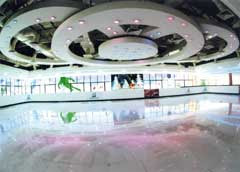 Semalam limpas di Kompleks Asia City saya ternampak tu Skating Rink di Kompleks Asia City. Terkejut jugalah sebab saya tidak tau pun ada itu Skating Rink. 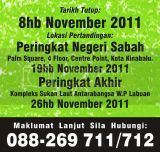 It is the first in Sabah. Bravo! Ouch! Defending champion, Andy Roddick was beaten by David Ferrer 7-6, 6-4 while Roger Federer survived. Wow! Buli tahan si Mew Choo kalahkan world number two, Xie Xingfang dari China (girlfriend si Lin Dan) straight set 21-10, 21-8. Berdebar-debar hati sia tengok game dia semalam hehehe. Sekurang-kurangnya mengubat kedukaan sia atas kekalahan Lee Chong Wei dan Mohd. Hafiz Hashim. Siapa-siapa yang termiss siri Heroes jangan lupa menonton siaran ulangannya setiap hari Isnin hingga Jumaat, bermula malam ini, pukul 11.30 mlm di saluran 70 @ Star World. Saya sendiri tertinggal first few episodes sebab mula-mula tengok macam boring tapi lama-kelamaan macam siok :p I'll definitely watch again! In a related news do click here. Kalo ikutkan saya tidak mau buat new posting. Sebab saya mau gambar Linda Nanuwil kekal di atas :) Apa-apapun, saya harap akan ada lagi cerita mengenai Linda di majalah, soon! 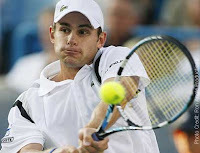 My favourite tennis player, Andy Roddick won the Washington Open by beating John Isner, 6-4, 7-6. Click here for the news. In a related story, the 416th-ranked John Isner of USA received a wild card in next week ATP Masters series in Cincinnati. He is the next man to be watched. For more news, click here.